The government has announced the first batch of 220 mining guards trained to police mining activities across the country will be deployed in April 2019. A visit to some of the areas in Diaso, Wassa in the Western Region confirmed large portions of Ghana's rain forest destroyed by activities of small-scale miners in the Diaso forest. The team will also be monitoring mining activities around water bodies. 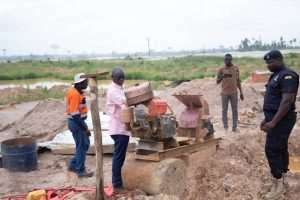 Speaking about some government interventions during a tour of some mining areas in the Western and Ashanti Region, the Lands and Natural resources minister, Kweku Asomah Cheremeh said they are hoping to train more field-based mining guards to augment the efforts of other agencies in the sector. He noted, “ we are committed to sanitizing the mining sector. This is why we are implementing a lot of innovative solutions. One of such is the training of the mining and forest guards. The first batch of the mining guards will be deployed in April. Another set of three hundred and eighty will be sent for training at the Police training school. “After their training, they will also be deployed to augment the efforts of operation vanguard. We are doing this to deal with the level of devastation in these areas”, he added.